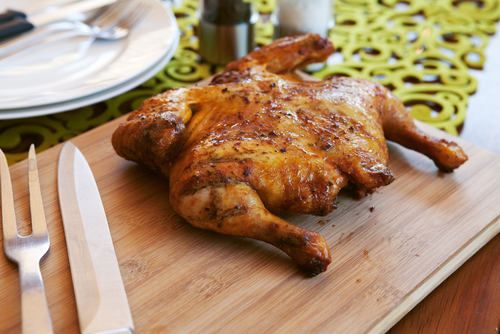 Our free range spatchcock chickens are made from a medium sized chicken and are fantastic for the barbecue. They are marinated in a marinate of your choice, we have lemon & herb, Piri-Piri, barbecue sauce and Argentine style marinates that bring out the flavour of our very juicy chicken. Please make a note in comments for the mareinate of your choice. TOP TIP: When cooking on the BBQ remember that chicken breast will cook quicker than the leg so you could always serve the breast first and legs a little while later.